In April 2001, as the rain drizzled down outside my north London home , I got a call from the Deputy Editor of Maxim Magazine telling me he was sending me on a ‘dream assignment’ to photograph untold numbers of nubile young women in short skirts flinging each other about in the bright Florida sunshine. What sounded like a dream very quickly revealed itself to be a nightmare as Daytona Beach Florida became a surreal reality. Apart from their nationality, what do Ronald Reagan, Madonna, Jack Lemon, Meryl Streep and George W Bush all have in common? The answer is that in their college years they all practiced the peculiarly American art of ‘cheerleading’, a strange, hybrid potpourri of gymnastics, dance and rampant gurning performed in a spirit of mindless, puppy dog enthusiasm. In the United States of America it is sincerely believed that ‘cheerleading’ counts as a genuine sport. It is a muggy night in the Florida resort town of Daytona Beach. The Cote d’Azure this is not. In some way the population seem to lack depth. The fact is that if you took everyone from the TV audience of the Jerry Springer Show, and all their families, and put them all in one run down string of shabby buildings fronting a white sand beach, then you may come close to understanding the atmosphere of Daytona Beach. Maybe then throw in the fact that, by State law, all men in the municipality must have a tortured mullet and all women must chew gum constantly; their mouths working in a gormless rhythm, their faces topped by painfully electric, bottle blonde, bouffant hair dos. Those buildings that aren’t shabby concrete motels manned by strangely shaped middle aged people wearing a graceless air of impenetrable indifference, are shabby diners. Each eatery must have a theme. Some of them have names like “The old Cowpoke’s Rest”. Others, as all over the world, are shrines to a mythical fifties Shangri La where all men dressed like James Dean and all women stood over sewer outlets with their skirts flying in the air. It is late. I sit at a table, my head in my hands, contemplating a snack the size of a post office. The fumes of petrol poison the taste of my beer. That is because the theme of this particular diner is motor car racing. It is, to all intents and purposes, a garage. Except for the fact that they don’t actually do anything useful. Like fixing cars for instance. Daytona Beach is a place that adds a frisson of real desperation to the concept of ‘homesick’. But there may yet be a salvation. Tomorrow this dreary string of prefabs and concrete will be transformed in to Barbie Doll heaven. From all over America thousands of nubile young women will flood into the town for the All America National Cheerleading Championships. The effect this invasion may have on the local population of slack jawed rednecks should be a performance in itself. Despairing of finishing the mountains of fries and grits and other assorted cholesterol rich foodstuffs on my plate, I decide to turn in and get a good nights sleep before the coming events. The next day Daytona Beach is basking in bright, late spring sunshine. I would love to say it looks better in the daytime, but I would be lying. There is however, a change in the people. Whilst the sea front is still peppered with the usual obese and sartorially challenged holiday makers and residents, there is now a new contingent and this crowd look like an outing from the set of Baywatch. Groups of tanned, lithe young woman dressed for the gym are wandering in groups and lounging on the seaside walls. Although smaller in numbers, their male counterparts, all of whom seem to be of hulk like proportions, are throwing Frisbees and conical footballs. Many are doing endless sets of press-ups, sit-ups and pull-ups. They are also making a lot of noise. Most of it is comprised of aimless, but friendly whooping and shouts of “yeah!!! !” and “alright!!! !” over and over and over again. As I arrive at a grassy area in front of the main hotel the scene evolves into something truly bizarre. The cheerleaders have arrived and the show is underway. The competitors practice for this all year and what I am witnessing is the final dress rehearsal. In separate groups, teams of cheerleaders from all over the USA are flinging each other about in ways that look both reckless and impressive. One team from New England, who have “Dogs” written in large letters across their backsides, seem to be in the throws of a schism. Their trainer is yelling at the row of downcast faces, some of whose cheeks are smeared with tears. None the wiser, I seek out someone who may enable me to decipher this strange litany of angst. Although we share something approximate to a common language and I respect his obvious passion and professionalism, I realize that Brad and myself are as culturally far apart as pygmies and eskimos. But he has a point. This ‘sport’ may be weird, but it is also very, very dangerous. 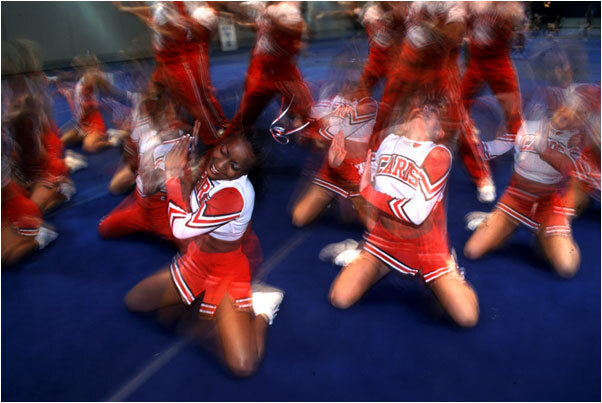 Between 1982 and 1994 more female athletes were injured in cheerleading than in any other sport in America. In 1990 alone 12,000 cheerleaders were admitted to hospital with injuries. A number were paralysed for life. Bearing this in mind it is with some interest that I witness the first heats of the competition. In a large, un-atmospheric hall under harsh strip lights team after team goes through their twelve-minute routines. A blur of tumbles twists and jumps and back flips. At first I look on with real admiration at the gymnastic and rhythmic skills of the contestants as the panel of twelve judges gives them marks for athleticism, creativity and rank insincerity of facial expression. But there are one hundred and eighty teams in this competition from the United States alone. That does not count the teams who have traveled from Canada, Costa Rica, Mexico and Japan to try and make their own dent on this free for all of American self-congratulation. After the thirtieth team has gone through the motions of bumping, grinding, flinging, jumping, landing and slapping their perfect little backsides to a sound track of fifth rate stadium pop or harmless white boys rap, I am sick and tired of it. I wander over and talk to one of the huge burly men who are in the business of cheerleader protection. Called spotters, it is their job to catch the girls if they fly off in the wrong direction. When not actually in action the spotter is posted directly underneath the mini skirted cheerleaders staring fixedly skywards at a never-ending succession of firm teenage behinds. After hours of being told things like, “cheerleading is a way to grow as a human being and learn to love others in a way that makes us all better as human beings,” by cheerleaders, trainers and judges alike, the spotter is the only participant whose motivation and sincerity I can completely understand without added explanation. The spotter’s name turns out to be Steve and I ask him if the tossers from the teams see him as some kind of a threat. “Hell no!” says Steve. “Half of them are gay in any case so the percentages work out fine for us and them. Four gals to every red blooded guy.” Steve looks happier than a roadie on a Led Zepplin tour bus. Two thirds of the teams having been eliminated – God knows by what criteria – in the opening heats the next day sees the grand final in a magnificent outdoor arena almost completed surrounded in gleaming corrugated iron. Inside important looking men sporting fat arses and vulgar Rolex watches are busying themselves around the stage. They are, apparently, the national media. Taking position at the front. I am informed that, “You cain’t stand there Sir.” The word “Sir” is uttered in a manner used only by Americans in authority and is delivered in a tone that implies his real meaning is not “Sir” but “douchebag”. “This spot is reserved for National TV,” he says with a dreary flourish of self-regarding pomposity. Although he makes himself and the event sound more important than the Bosnia Peace treaty and a Cold War presidential summit all rolled into one. I make way both for him and his even more serious looking retinue of sour faced interns. He is not the only one behaving as if all this meant something. Following Steve’s advice I seek out the team from Houston Texas. They are in a huddle giving each other strength for the upcoming routine. As I approach I realise that the only custom more vacuous in this event than the ‘facials’ must be the ‘verbals’. “Love y’all!” Says one to all the others. “Right on!…. To the max!” another replies. “Love y’all,” adds another one. “We are Houston! We are Houston!” her friend points out. “Love y’all!” Another chips in. Having grasped the gist of their strategy meeting, I return to the main stage. Where Georgia are now in full flood. Steve is right about their general outlines… And there he is looking eagerly at the subjects of his appreciation. After two days of this I, however, am now so bored as to make me dizzy. All the routines are exactly the same as the ones they did yesterday. Most of them are exactly the same as their competitors. That means that if you watch this whole event then you will watch the same thing nearly four hundred times over. It is the stuff of nightmares. A man can only endure so many back flips and inanely stupid facial expressions before he wanders off to lay his hands on an axe. But I have to stay to see if Houston, now my adopted team, can stay the course. Dirty they might be, but they have lost the plot when it comes to flinging each other about. They are a disaster. Two of them tumble right off the mat, much to Steve’s gleeful satisfaction no doubt. Their awesome crumbles and they come bottom of the heap. Funnily enough I don’t care. I have had enough. Not daring to ask what you would actually have to do to be a loser in this town, I content myself with watching the event bought to a close with a mass simultaneous ‘awsome’ of a hundred girls. It is an impressive sight. A forest of nubile flesh. A hundred beautiful teenage girls all doing exactly the same thing at exactly the same time. It is a superb national party trick and every mulleted redneck in the town stands transfixed. I look again. It is impressive. Very impressive. But I can’t help thinking….. What is the point?